I’m still waiting for my portable workbench vise to arrive in the mail so I can start playing with my Lie-Nielsen 102 block plane and the blocks of wood I have sitting here that are just crying out to be made smaller. In the meantime, I am undertaking a few home improvement projects that will help me get a better sense of wood and how it works. 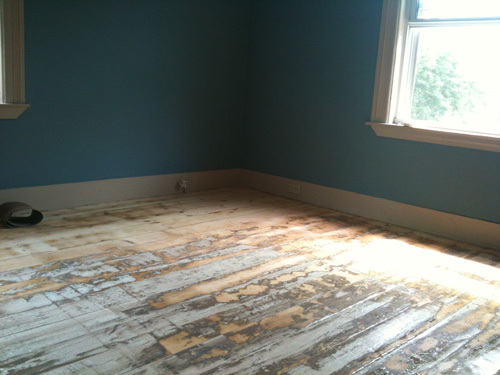 The first on the list is to sand down the floor in one of our upstairs rooms. 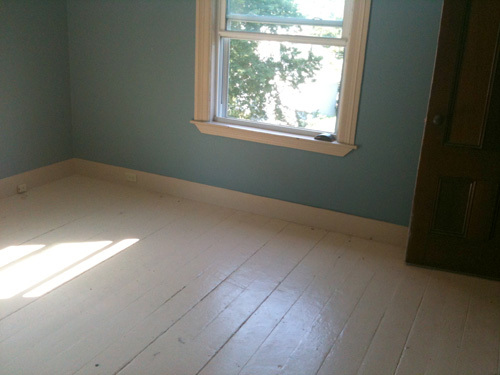 Our house is 130 years old, and I think the first layer of paint went on about 129.5 years ago. It’s possible a new layer has been added every year since then, because even after 5 hours of sanding with a floor sander, we were only about halfway done. Oh well, that’s what next weekend is for. We did accumulate a full bag of sawdust, and that’s not even including the thick layer coating every inch of me, not to mention the thin layer on seemingly every object in the house. Chalk this up to my first lesson in woodworking – sawdust is tricky stuff, and learning to control how far it wanders would be a good piece of knowledge to have. 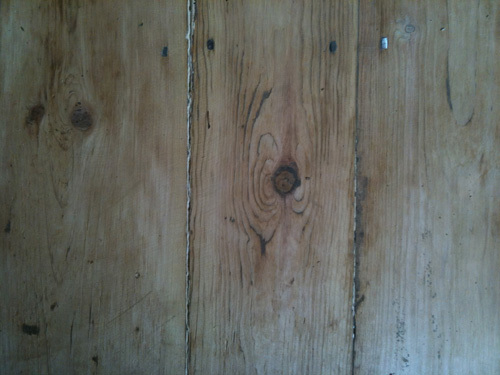 As for learning about the wood, we’ve been told that our floors are douglas fir, and man are they beauts (once you get under the cream, then the white, then the chocolate brown paint covering them!) Running the sander over them – many, many times – gave me a sense of the strength of these boards, but also an awareness of how each board has moved over the last century plus. Gaps between some of the boards were wider than others, and some of the boards were definitely higher up. Not sure if this means they moved outward (i.e. upward) or if they were just not planed as flat as the adjacent boards. All in all this was a great first lesson in this medium I am getting set to launch myself into. And a good reminder of what it is like to try something completely unfamiliar. Hour One with the floor sander I was very unsure of myself, but by Hour Five I was, while not an expert by any means, pretty at home with this giant piece of equipment. Just goes to show how much just doing the work can improve your confidence and your abilities. Now, does anyone have any ideas for how to use several pounds of sawdust?